Save Energy. Save Money. Save the Environment. At Pro Energy Consultants energy consulting firm, our mission is to help American homeowners make informed decisions through home energy audits and energy management consulting. By applying a holistic, scientifically-based home performance approach to your home, our energy management consultants can help you understand your home as a set of inter-related systems, all working with, and dependent upon, each other. For the first time, you can make decisions armed with definitive and objective evidence, coupled with an eye-opening new understanding of how your home works. 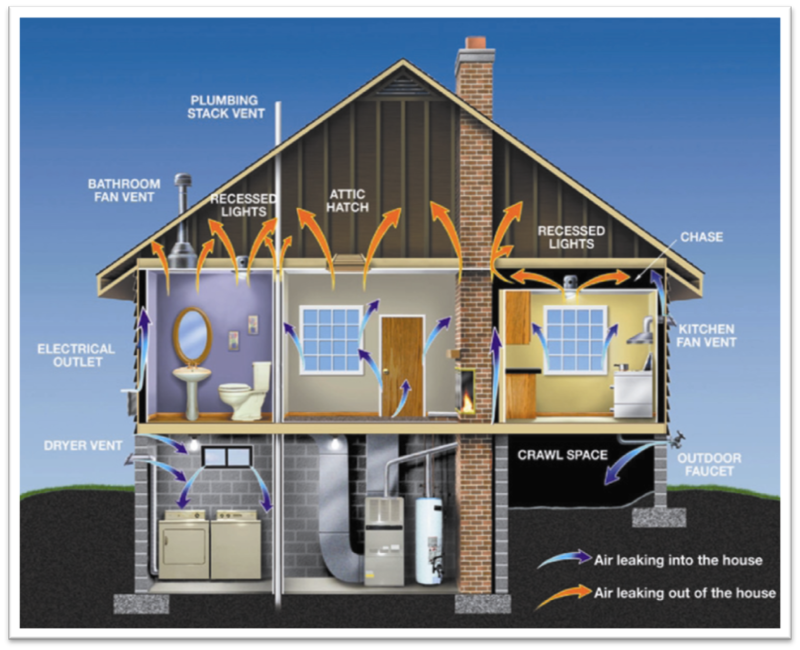 The graphic below depicts all the ways and places your home can be 'leaking' energy. On average, our energy consultants find leaks that equate to a basketball-sized hole in the property! You can imagine the impact on energy bills and indoor comfort. We want you to make the right decisions, for the right reasons. For your energy consumption. For your comfort. For your budget. And for your planet.